Punch Bowl Cake Recipe includes an old fashioned Pineapple Cake frosted with thawed frozen whipped cream and flaked coconut. The second no-bake cake is a Strawberry Cake topped with only whipped cream. These cakes are perfect for holidays and special occasions. They free your oven to bake other goodies. Both delicious cakes can be layered in a glass Trifle Bowl or assembled in a 13" x 9 1/2" oblong glass baking dish. Place dry Jello in a mixing bowl. Stir about 3 minutes, until gelatin is completely dissolved. Let cool, then place in refrigerator until mixture just starts to thicken. Meanwhile, prepare punch bowl or 4 quart mixing bowl** by lining inside with parchment paper. Smooth out the wrinkles as much as possible. Stir in pineapple and juice. Fold in 1/3 whipped topping, which has been thawed, until it is mixed well. Pinch off bite-sized pieces of cake and line bottom of bowl. Add a layer of the Jello mixture. Keep adding layers, ending with the cake until all are gone. Cover with plastic wrap and refrigerate at least 12 hours. Unmold cake onto a serving platter. Carefully remove the parchment paper. 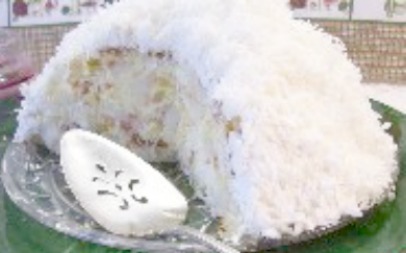 Frost with the remaining topping and sprinkle with coconut. Slightly defrost strawberries, slice them and fold into slightly thickened Jello. Do not use whipped cream in the jello mixture. The traditional way to put this cake together was to layer it in a small punch bowl and top it with whipped cream. It was served by spooning it out of the bowl onto the dessert dishes. The cake was often the focal point of a buffet table. Today, Angel Food Cakes come in a variety of flavors and sizes. Vanilla flavor tastes best with these cakes. *A 10" cake might be 6" tall or 3" tall. Therefore use a l pound size for these cakes. **These cakes can be assembled in a trifle bowl or oblong dish, as noted above. You will not need to line these dishes if you plan to serve them from directly from the container.